Below you can find their answers. These are provided unedited, with only minor formatting changes to improve readability. I love judging, I love judges, and I love the judge program. I am passionate and driven. I know how to channel that passion into action. I will devote my passion, time, heart and soul into my role as a PC and to the judge program. My accessibility to, and inclusion within new and underrepresented groups within the judge program means that I can be a conduit for those groups to feel heard. I can help craft messages to the breadth of the program so that they see a more transparent and receptive leadership. I am familiar with keeping certain aspects of judging secret or discreet. Having been on the JCC, as well as having often been a confidant of other judges on sensitive manners, and trusted by TOs with event knowledge that is not open to the public yet. I am a team player and excel at being a leader. I have been applauded for my efforts as both a show lead, head judge and team lead at multiple conventions, Grand Prix, Star City Games Opens and other large scale event work. I have received multiple Head Judge and Staff recognitions at Grand Prix this year alone. I also have many times been able to work with other members of the team on multiple large scale projects where I am not the lead, most notably Collected Company and the JCC. I work well with others and believe that reasonable discourse and disagreement is an important contributor to a healthy and functional program, especially one as diverse as the judge program. I speak in straight lines; I say what I mean, and I mean what I say. If I give an opinion, or an answer to a question, I have thought it through and honestly mean it. I try not to shade my meaning nor “sugar coat” feedback. I want all judges to feel like they are part of something bigger than themselves–all levels, all regions, all genders. Women in the United States, especially at the upper levels of leadership in the program, have been underrepresented for many years. We haven’t seen a woman from the United States as a Grand Prix Head Judge since Ingrid Lind-Jahn. We have never had a woman serve as Program Coordinator. We now have two women from the United States serving in the role of Regional Coordinator. I want to keep this momentum going. Europe has had representation like that for a very long time, strong, capable, competent women who show that you can be who you are and be successful. I am that role model for women and want to continue to be for the ones come after me. I am a member of the JCC. I have worked closely with Cristiana and the other members of the JCC to refine the JCC process and offered solutions to help that refinement. My presence on the JCC is a representation of the trust placed in me to be honest, fair, unbiased, and discreet in my dealings with the most sensitive topics that arise in judging. The other aspect of being a JCC member is being sensitive to multiple cultures, view points, and traditions outside my own. This has given me a greater understanding of what it means to analyse and take care of the program as a whole and not just from my own point of view and experience. I am one of the leaders of The Collected Company Mentorship Project. Megan Linscott and Megan Holden founded the group, and I have been part of the leadership team since its inception. In doing so we have created the first continuous targeted global mentoring project. Our project services members on every continent with organized play. I am active, engaged, and consistently been available to advise and lead judges around the world. I instrumental in helping start an almost cultural revolution that has made many judges reevaluate how they view women in judging. I have travelled in- and outside of the United States as an ambassador for the project and used my status as a well-traveled judge to influence a great many judges. I created the Great Lakes Region’s Next Step program. Next Step is an onboarding program for L1 judges to help them feel welcome and plugged into their local and greater judge community. It also gives them a great tool kit for starting off judging on the right foot. I shared this project with the entire L3 community to use in their regions if they so choose. I’ve also adapted our documents for use by leaders in other regions. My role as a Program Coordinator would be to do just that, coordinate the different parts of the program to form a more cohesive unit. I personally would want to be tasked with making sure that announcements from the PCs are better disseminated throughout the program as a whole and streamline our communications with the program; a PC Public Relations Representative. Along with that I would want to take charge on establishing better communications between projects who rely on one another for support to better ensure the success of their individual missions and tasks. I believe that part of the problem currently with the European/US divide is simply one of perception. The JCC lead, the RC lead, the L3 Process lead, the L2 redefinition lead, the GPHJ Lead, and 3/4 PCs are all European. When something goes wrong it is easy to say that if they were not all European then it wouldn’t have gone wrong. Also its intimidating to approach a group you are unfamiliar with, many of whom you’ve never met in real life, and talk about concerns you have. This is an especially dramatic shift for judges who spent a lot of time with L4 and L5 in existence as the L4s and 5s were slightly better distributed between the two continents. This also becomes a problem from the European side as it makes the United States seem defensive, because they are. Combine these factors with a richly diverse cultural background and you have a perfect storm of “us versus them” mentality. I will foster communication and coordination between the two groups. Level 1s and 2s constantly bring forth the notion that L3s are unapproachable, that we are scary or intimidating, and that the process to become a Level 3 seems to be shadowed in mystery and gatekeeping. While I don’t believe that all of these things are completely factual, they are still common concerns and deserve to be addressed. Helping underrepresented, and alienated judge communities feel more included and more a part of the greater program. L1s for a long time have been struggling to find their place in judging. Struggling to feel part of our, of their own, community. They feel that once tested they are soon forgotten and left with no support system. We have been setting them up for failure rather than preparing them for success. They are lost, in a large new world where approaching leadership is intimidating at the best of times. It is becoming increasingly more difficult for new judges to convince local store owners and other TOs that they are needed to run events. The true power of an L1 versus that of someone who is just very knowledgeable with the rules or with policy is their connection and access to the collective experience of the judges around them. I want to restore, and encourage this connection. There is a perception that the judge program, and Magic in general, is the US, Europe and everyone else. While the largest concentrations of judges may be within those geo regions that does not make this program any less thiers. I have been to Leadership Meetings at Grand Prix where South American L3s, when asked their opinion, said that they didn’t bother to give it because they didn’t matter, they only got a few Grand Prix so it didn’t matter what they thought or felt. These things should never happen. No judge should be made to feel like they do not belong in the program. The program belongs to all of us. I will work to make these judges know that they do matter, they do contribute and they do have someone who will listen. I would start by coordinating and actively pushing PC announcements, and otherwise critical program-wide information in a more thorough manner. Making sure that things like announcement articles get pushed to common regional communication methods, Facebooks, blogs and other media platforms, via the regions RC or their designated communications proxy. The information pushed out would be infinitely more successful if handed to an RC or the communications person in a region to distribute in a way that is most fitting to a region. Whether that be slack, Facebook, Twitter, Discord, or some other platform. Coordinate how and when the PC answer questions brought to us. This gives us the ability to have a united front on issues, while giving our personal opinions in a more private setting. When a project relies on another project for parts of completion of a task or mission I would help make sure all leads and members are on board so that no one group is blindsided nor pushed into helping beyond their bandwidth as well as having input in decision making processes for project components they have responsibility for. Identifying and brainstorming solutions for communications breakdowns especially in regards to PCs and committees of concern. I will continue to support the Planar Bridge project and work with the leaders in that project to try and extend their reach to L1/2 outside of the Grand Prix circuit. I want to see similar talks happen at local judge conferences and meetups to bring concerns to the project as a whole so that those concerns get forwarded to the people best equipped to help. I also plan to continue to extend Planar Bridge to other georegions by asking RCs from underrepresented regions for recommendations of judges to add to the project. (All of this obviously done with the permission and participation of the leaders in the Planar Bridge project, this would be a position of support not one of command) I believe that the largest benefit of this project is giving L1/2 a voice. The perspective of those judges is vital to a healthy and well rounded judge program. I have personally done my best to attend every Planar Bridge meeting I can and tried to coordinate cooperation between the L3 Leadership meeting and the Planar Bridge meeting. As a PC I would continue to do so and continue to show that even at one of the top levels of judging someone does truly care about the L1 L2 voice and will continue to fight for that voice. I would continue to develop the Next Step program to include the other levels of judging. This stops lower level judges from feeling that tasks and requirements are arbitrary and that the higher level judges are just “gatekeeping.” I would include an easily digestible version of the checklist for both L3 and L2. Not just another reiteration of the checklist but an explanation of what each item means, as well as what part of judging it is meant to measure. For the Level 3 version of the Next Step documentation it would contain a description of what the actual PEI and Panel process is like and what a candidate can expect from those portions of the L3 process. The information for these new Next Step portions would be a culmination of all of the available materials that are currently published, just condensed into a more easily accessible form. Each section would have a link to the original article, blog post or discussion topic the information was gathered from. I would gather a team to maintain this project and coordinate with both Alfonso and Matteo for the L2 and L3 requirements respectively. Divide between Europe and the United States. Often times important issues on the L3 forums get bogged down in arguments often stemming from misunderstanding due to culture and expectation. I want to add more forum monitors to the discussions so that the white noise on the forums is filtered out so that we can get to the topics at hand. I would work with Scott Marshall and make this a priority. This would also come with a fundamental shift in how forum moderation on the L3 functions. I would recruit a team of L3 moderators to guide forum discussions. These people would help sort out cultural disconnects and keep the discussion relevant and actionable. Building new crew of moderators would introduce new opportunity for judges with the right skills and attitudes. I will break down the walls between the two groups and discourage the sniping remarks and antagonization of each other in places like the Leadership meetings and other places where we meet. For example, I would set a clear standard in GP Leadership meetings that bickering or insults are not acceptable Instead I would encourage and foster an environment where we work together to jointly discuss and actionize topics. I would start a best practices and idea sharing primer for US, European and other georegions large events. Many of the qualms I have observed and heard of from events is from the way in which those events are run and general uneasiness caused by a different Grand Prix kit, or player base. Many times this uneasiness is caused by something that is different from what a judge is used to. L3 tend to get set in their ways, get used to being the best event judges in the room. I want to remind and then reinforce the idea that we are just different and neither is better nor worse. Practices and protocols often work in once place because that is what is suited for that place. For example Japanese style of running ODEs while is almost miraculous in Japan would burn to the ground in United States because the player base and expectation is so vastly different. That does not make one or the other worse. This also extends outside of events as well, project management for example I have observed to be vastly different when the lead for a given project is European versus the US led projects I have participated in. With these type of georegion primers I want to foster an understanding of a culture and protocols that may be unfamiliar so that the initial experience of that culture or protocol isn’t one of confusion that turns to frustration. When projects are searching for volunteers, get in contact with the RCs of underrepresented regions (for more than translation concerns) and ask for recommendations from all levels of judges in their regions who would be well suited to the project or task. While this does happen as a more passive way, I would encourage it actively. This would be especially important in program-wide projects, or ones that have the potential to be program-wide. Aspects of projects change and vary based on the unique properties of the judges the projects affect. I will be a discerning voice that can distinguish workable solutions to address georegional issues while being properly positioned in a global system. Sometime US, EU, JP, AU and SA will all need to have different answers. What matters is drawing the lines between them appropriately and doing so in ways that are clear and that still allow for idea to be tried out across boundaries. I would develop Next Step to help onboard Level 1s in their local areas. In regions that are not as population dense as others a judge could get tested for L1 at a conference and then never speak to another judge again for a year or more. Helping to onboard in local communities and regional ones helps judges realize that they aren’t just left to fend for themselves. I will contact interested judges in different regions to discover the unique challenges and requirements for different regions, and to see if similar programs exist in those regions. If a similar program exists in those regions I and my team would analyse how those practices could be incorporated into Next Step and see if any of those practices could be helpful in other regions. I believe that the primer for events that I mentioned earlier will also help on this issue. For example, having a primer for how an event is run at an Australian GP and the challenges unique to that area helps place them on the wider world stage and gives the opportunity to share knowledge and cross pollinate ideas. Thank you for reading, and I hope that I have given you a clear picture of what I stand for and what I would do as a Program Coordinator. Good luck to all of my colleagues in this process. I see as the role of Program Coordinator as important in helping our community continue grow and hopefully thrive and as such, like everyone else applying I imagine, the main reason I am applying is because I feel I have something important to offer the role. My accomplishments within the judge program include being an active part of projects focussed across the judging spectrum. I am a part of the Welcome to the Fold project that marks the achievement of working your first Grand prix event. I am a member of the current JCC team. I am one of the newer Level 3 panel members and I am involved in the Level 3 maintenance, evaluation and demotion projects. Through these projects I feel I have gained experience and an appreciation of the aspiration within the judge program as well as the struggles and concerns that afflict its members. These projects allow me to make the most of my soft skills and encourage others to consider situations in new ways. Outside project work I am known as someone that people can come to, either for support with their struggles, help processing an experience or just for a perspective on how things will impact other people. In all of these I draw on my professional skills; I work and am trained as a Humanistic Psychotherapist, offering a combination of unconditional positive regard, empathy and congruence. This means that people recognise that they can come to me with anything and know they won’t be judged, I will try to understand and that my understanding and compassion is genuine. Further to this I am trained to handle ethical dilemmas and confidentiality, meaning that I can treat what people tell me with discretion and responsibility to the person, myself and the wider community. I believe I am a fit for this role in part because of the skills and knowledge I have, but also – and to me more importantly, because of the reputation I have cultivated within the judge community. I know that many people feel that they can come to me with any problem or concern, this week alone I have spoken to judges seeking to reflect, those trying to cope and those celebrating success. I have also been sought out to feed into projects and situations that I am not a part of within the program, which I am happy to do and feel a I gain a lot of perspective from being involved with. Another reason that I feel that I have something to offer is that I see the program going through an identity crisis, as a collective we can’t say for certain if we are hobbyists or professionals. This poses the question of “what we then expect or want from our leadership?” I’ll readily admit I don’t know the answers, but I never do with my therapeutic clients either, I want to help us find our identity and to be proud of whatever that is. My hope is that through the role I can improve the impact that the program has on judges, both in the individual and the community. I believe our current communications often start with the best of intentions, well considered consequences and goals to improve the program for judges, organisers and players. Through talking to a wide variety of judges I am aware that despite these positive beginning what is often experienced is confusion, hurt and defensiveness about the intentions. Consequently, I would like us as a program to consider our communications, particularly around significant roles and projects, in a way that encourages engagement with us and allows community expectations and feelings to have more consideration. I also believe that my open and accepting presence means judges talk to me about the things that are troubling that they wouldn’t normally talk about with others, this I believe would be an asset to the PC group as well. I am aware that although we are a community with a common interest we are also one filled with subcultures and subcommunities, not all of which are vocal and identified. In recent years growing diversity and pride in that diversity has, I feel, been one of the greater successes the judge program can claim. While in those areas we have a long way to go still there is simply no denying that those groups and demographics finding their voice has been empowering and has stimulated positive thought and growth in many areas. I want to try to increase that reach through openness, acceptance and above all support. I don’t think the attitude is absent in our leadership, but I feel it hasn’t been a focus or a priority yet. Some of the voices I would particularly like to encourage are; those that struggle with the crowds and anxieties that are a natural part of events, those who struggle with their own problems but that the program doesn’t help with or doesn’t publicise its support with (such as the support I received in managing my dyslexia within the program) and also those voices that feel that the program offers too little transparency. I still feel as I did in my last application that there is far more subjectivity in our policy around interaction between players that we tolerate in our rules/hard policy. I am keenly aware of the fact that the policy needs to have that scope. However, I do feel that the examples given in the IPG fully explain something like marked cards more adequately than our policy around unsporting conduct (particularly Minor, Major and Aggressive Behaviour). I feel judges need additional resources to refer to so as we can consistently apply this policy and more than that, that judges feel secure knowing that we support them in handling those calls. Examples that spring to mind are around the varying kinds of discrimination through language and the multicultural nature of the program, meaning that even simple and seemingly obvious words and concepts, such as respect and safe-space, can have many possible interpretations. As a PC I would like to push for these additional resources and help us make USC a tool for creating the kinds of play spaces where people feel they can be comfortable as themselves. In this I am of course dreaming of perfection, regardless of how much progress can be made in the end I feel it is something worth pursuing and taking as far as we can for all of us. Another area I want to focus is encouraging us to reclaim our former relationship with personal-development and growth as a judge. I hear a lot of judges saying they don’t get enough feedback and reviews, which I think is fair, when we are busy and have events to focus on and when we are done we are tired. However, I believe we can continue to push for greater feedback and I think there is also a lot we can do to empower judges to look for their own feedback. Exclusive reliance on others to provide us with feedback rather than seeking to include our own sources of feedback can leave judges stuck waiting for others to help them progress and develop. If, as a community, we embrace deliberate and reflective practice attitudes towards our own growth and judge interactions we can take back that control and find feedback for ourselves that both empowers and challenges. I use a system of reflection on my own judging interaction, which I have shared with teams at GPs and I’m slowly (dyslexia being what it is) writing an article on. This regularly gives me feedback on how players seem to have felt I did, or what policy I am less comfortable with and this means my growth is within my own control and that regardless of other people’s input I know I have tools I can use. In working on our communication structures, I would want to focus on us having a new framework for delivering important communication, particularly regarding projects and roles. This can be developed into a check list that can be considered before the publication of any such information to the wider community. Aspects such as the timing of announcements and the emotional impact of changes should be a key part of how we communicate changes through the community. Even when processes have been outgrown or been found to be fundamentally flawed there will have been committed individuals that are worthy of our thanks and sympathy who will be affected by changes we are choosing to implement. Building into this as well a period for immediate response before implementation and a date for review of changes would also allow community members the chance to decide for themselves if this is an investment of their time they wish to make. Equally at times within the program there are controversial projects that the community has concerns about that I feel we can do more to support our judges with. That community members feel there are sometimes questions or alternatives we won’t engage with is unhelpful to all parties. Where questions are asked repeatedly in different places, in part due to the saturation of social media, key projects having FAQs/explanatory articles could save us time and help others to find the answers they need. When these are insufficient, attempting to foster a culture of open engagement and curiosity rather than one where concerned members of our community experience us as avoidant or defensive would, I believe, do a lot to bring our community together to find and accept solutions, new or old, to problems/concerns that arise. Investing time in supporting documents for IPG penalties involving the subjectivity of the interpersonal interaction between players is I am aware potentially a job without an end. With all the different cultures and languages, the game is played in the policy will never be as exact as our hard skill and rules-based policy. By sampling community opinions though we can start to create clearer support for judges who don’t see the socially subjective world the same way as others, and that is all of us. USC, primarily Minor, Major and Aggressive Behaviour, are the penalties we have for all of the less obvious forms of discomfort and prejudice we find at events and investing time in supporting judges to use this tool in a supported and consistent way shows we are committed to the safe-spaces and respect we talk about at events. For this to be successful it will need the engagement of judges at all level; L1s at FNM in their LGS will see an equally vital part of the picture as the L3s leading at GPs or L2s running PPTQs, and an appreciation that events are not all the same. The first version of such a support document can only work if we are clear it is open to amendment, cultures change, and we could never capture everything that needs to be in there the first time. The game is simply too big, and multiculturalism needs to be accounted for in order to avoid or find solutions to any conflicts within policy. An investment into deliberate and reflective practice is both an investment in techniques and resources and promoting it to become a part of judging culture. Through teaching judges how to reflect on the small things the do to gather feedback and to try making small changes to develop those skills we can show how possible it is, and there are already those that do this. For the last five years I have had success presenting on self-reflective practice, the response I have had to this means I am confident we are open to it as a community it only requires a greater investment and focus. By encouraging this attitude to develop into new areas, through Head Judges at large events, and team leaders, and mentors at all levels of the program, we can show that feedback is always there. This is also an investment in customer service as considering our impact not across an entire event or a progression plan, but on that single interaction means that if we find we have made an error there is time to go back and either make things better or to enjoy that we did that task well and are making progress. A part of accomplishing this is accepting our limitations, these aren’t jobs that once its done are done forever. A discussion I had with a member of our community showed me that sometimes we have to accept only “good enough solutions”, I’m not sure I am entirely there yet. I am an idealist, but I do understand they had a point. Even if accepted to be a Program Coordinator I would have a limited time to try to make a difference. I think there is a realistic amount here to make changes that could leave a lasting improvement and make things better for all within the program. I believe I have a lot to offer as a Program Coordinator. I see the Program Coordinator Advanced Role as a multifaceted role. You are trying to build a team where each individual brings something unique. The role of Program Coordinator is as much about creating a vision as it is in overseeing the execution of that vision. While I have my own ideas of what would make the program better, I also listen to others. Creating a vision is often about collaboration and it’s naive to assume my perception of a problem is the most correct. To that end, I seek understanding and ask questions. I attempt to explore impacts and consequences of decisions and define its scope. Yet, I understand that eventually you have to make a call, even when you don’t have perfect information, and you can’t reach a consensus. I feel my biggest strength is in execution of vision, either in the actual doing or overseeing of it. I take ownership in what I’m working on. I feel responsible for its successes and its failures. I follow through on commitments and communicate clearly when goals and commitments change. I believe you set expectations, you have an obligation to reset those expectations if circumstances cause you to alter your goals. I respect my fellow team members and keep them engaged and focused on the end goal. – Ive been the Annotated IPG lead for 4 years, where updates have been completed one week after the policy is updated. – Ive been the Exemplar Lead for 3 years. We have a complex schedule with lots of moving parts (coordination with the team, WoTC, SW Development, RCs, Conferences, Social Media) and we stay on target and meet our obligations, while iterating and improving each wave. – Host of Judgecast for 7 years, producing over an hour of content for the Judge Program 25 times a year. Which involves identifying items of interest/problem areas for the program, pulling together information on the topic, possibly scheduling a guest, creating an outline of the episode. Also, it involves feedback to other hosts, and a cycle of improvement. – At the latest Leadership Meeting, I took 4 action items. 3 of those action items were complete by the end of the week, and have already been realized. The 4th one, the program-wide survey was created, translated and posted in less than 10 weeks after the action item was given. – Worked with Wotc on a program wide judge foil distribution. Basically, I’m a hard worker, I pride myself on doing what I say I’m going to do. I also pride myself on the methods I use to find the best choice. I have my own opinions, but if data is pointing in a different direction, I don’t hold on to those opinions anymore. I want the program to thrive, and I want individual members to be set up for success. That optimism is also balanced against the constraints of the system we are in and the resources we have available to us. Which leads to another aspect I consider a strength, which is determining the “and then what”. This involves considering the impact of decisions, possible branches or consequences that would result from those decisions, so that you can work into the solution a way of dealing with them. This also allows me to identify the branches of the program impacted by a change and which spheres need to make changes. As something else I would list as a relevant skill, is my familiarity with how US Corporations work. 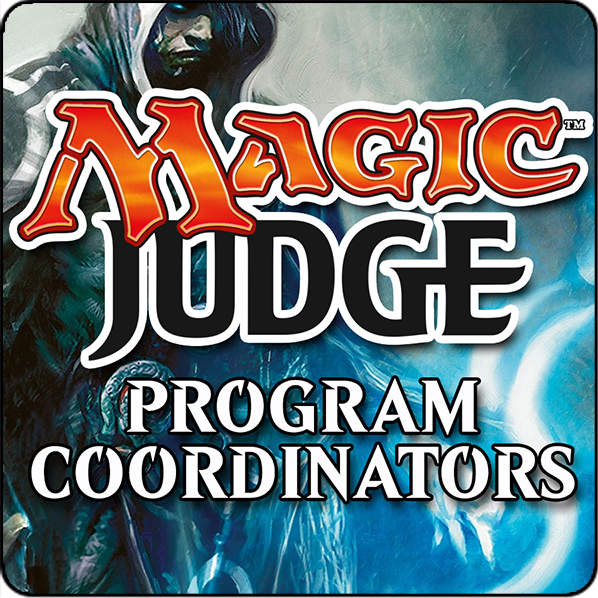 While the PC role oversees aspects of the Judge Program, it also interfaces with Wizards to determine future strategy. I have 20 years experience in a large profit driven corporation. That experience helps me understand and relate to corporate problems, as well as knowing that the person you interface with and the person that makes decisions aren’t necessarily the same person. However, I am skilled in framing issues and solutions in terms of value gained and returns on investments in order to convince those with the actual decision making authority to make changes. There are a few things I expect to accomplish. Not surprisingly several are the same goals I had last year. One goal is to explicitly demonstrate what the PCs do and to make the position less of a mystery. Even after nearly 3 years of having PCs, very few people are actually clear on what PCs do. In part, this is because the original concept of the PCs, the air traffic controller, is largely invisible. You can write blogs about updates to Judgeapps, or small changes to the education sphere, but for the most part, those changes don’t command any sort of persistent attention. The second part is that the program expects the Program Coordinators to be Program Leaders, and there is no direct, overt leadership coming from the PCs. This mismatch of expectations results in people not knowing what the PCs do. My second goal is a two pronged. There are metrics that Wizards has put out that show that events with Judges are better attended and better run. However, our relationship with Tournament Organizers is all over the place. In many places, TOs don’t see the value of Judges, or don’t believe judges are worth as much as they think they are. I think we, as Judges need to hype the advantages of having a Judge more. Wizards isn’t doing it anymore, and they are unlikely to start again, so we need to advertise the advantages of having judges. However, we also need to make sure that the judges we certify are worth the hype. In this regard, judging needs to be made more exclusive. We advertise that judges are experts at running tournaments. They need to be worth that praise. So the goal here is to both show TOs the worth of Judges, as well as ensuring that Judges are worth what we say they are. A third goal is to find a way to improve program morale. Right now, each level has its own unique morale problems. L1s are feeling that the program doesn’t value what they do, L2s are feeling burnt out with PPTQs, or there aren’t enough high level opportunities. L3s are overworked with program bureaucracy and worried about the changes CFB is going to bring to the Judge program and how that is going to impact them directly. A fourth goal is to reduce the administrative burden on L3s. Since the creation of Advanced roles, the amount of administrative work has exploded, and it’s only a small group that is doing it. The goal of “transparency” in order to reduce the perception of a good old boys network has resulted in an unsustainable system, and doesn’t seem to actually generate any different results. The fifth goal is a goal of mine regardless of if I become a PC or not. The goal is to work to restructure the level system so that judges can feel more fulfilled in those levels, and expectations more closely align to the reality of OP. I feel like we are moving to a system where “certifications” don’t actually matter anymore, and we need to position ourselves with a system that can support the program if it occurs. My first goal is explicitly demonstrate what the PCs do. One of the reasons people have a hard time remembering what the PCs do, is because no one sees them do it. I don’t go to a lot of GP, so there might be a lot of interactions there with PCs within the context of that role. But outside of those events, PCs don’t seem to interact with the program in any visible way. In the recent survey, we had 1000 judges respond. Nearly a third said they didn’t know who the Program Coordinators were and what they do. And these survey takers are ones that presumably very active/involved in the program. Quality is one of the programs core values and a focus of the PCs? Great. I only know that because I read the mission statement on the blog site. What are the PCs doing to show that this is a program priority? Talk about it. Be open and honest, and repeat the message. A lot. Wherever judges are. Engage them. So, things I would start doing. First, have a reddit AMA. Let people ask questions. Let the various PCs answer the same questions so people see how they are the same and how they are different and what they value. While doing this, you are opening a dialogue. The next, I would probably create a Twitter account to hype/give a stamp of approval to Judge posts and projects, and where people can reach out with questions. The “mail the pcs” mailing list might be great for formal communication, but the conversational aspect with the leaders of the program needs more visibility. Talk about things publicly. Be seen talking about them outside of meetings on Sundays of GPs. Finally, i think we need to realize when the program *needs* its leaders to be vocal. The attacks around Christmas, the PCs were too slow to react. When background checks hit, the PC article was…not what the program needed. A lot of people felt betrayed. If the Program Coordinators are the program leaders, the Judge program wants to see those leaders defending its judges..
My next goal is to make the individuals in the Judge Program live up to the advertising hype of the program. But first, we need to create that hype again. Here I would create an ‘Outreach’ Sphere. Its purpose is talk to the non GP TOs, and find out what their needs are. Talk about how Judges can meet those needs. Feed those needs back to the PCs with recommendations on how to Correct. Create material to distribute to TOs about the good things that judges can do for them. Additionally, we need to increase the importance on event skills, and change requirements and the tone of the program to reflect this importance. We need to establish and document a curated set of ‘best practices’ for running events, at the store and even larger levels. And we need to actually formalize and complete these maintenance tests we keep talking about, or get rid of the requirement. Speak to the Conference sphere about the creation of a standardized role-play workshop for mini-conferences that focus on TO interactions. Another goal is to find a way to improve program morale. Measuring morale is pretty tricky. Typically we have measured it anecdotally, but there are a lot of common consistent complaints from the various levels. And the survey indicates an overall unhappiness with the program. L1s are feeling that the program doesn’t value what they do. One thing I want to do is to find a way to give L1s an identity. Many L1s right now feel that their level isn’t worth anything, because the things they are allowed to do, an L0 can also do. I think we need to shift the focus that the difference between an L1 and the guy behind the counter at the store, is that L1s want to run events. They want to make events better, and they just happen to know the rules. In order to do this, we need to raise the requirements of L1. The Judge program needs to be more exclusive in terms of skill. One of the direct ways to improve morale, Is for wotc to show that it cares. Wotc does contribute resources to the program, but not in a way that is directly visible to Judges. There are other avenues that can be explored. Additionally, I think encouraging L3s to participate more in the Regular Forums or even an update from the JAR team would be helpful as L1s would see L3s paying attention to Regular. L2s are feeling burnt out with PPTQs. I think this is because there are too few L2s and too many solo PPTQs, and they feel isolated. The true solution to this problem would come from WOTC, but we can mitigate the situation somewhat. I think a solution would be to start prioritizing non-event Judge gatherings. Perhaps a dinner or a draft night or laser tag; something to bring than together and have fun swapping stories, and bonding. Not only can this re-energize the L2, it would allow L1s who are considering going for L2 to see healthy, happy L2s instead of sunken-eyed husks. For L3 morale, I think a large part of the low morale would be addressed by my fourth goal. For L3 bureaucracy, I think we need to look at what projects are only open to L3s and consider opening them to L2s. Things like Level definition groups, or the JCC or the PIC. We also need to take a good look at what’s really necessary. Committees, and Survey, and Tests, and maintenance and Panels and Projects and Projects about Projects, and its restricted to L3s. Probably about half the time L3s spend on projects is managing L3. Having dozens of positions open a few times a year that require teams and full month long evaluations is too much. I would want to open up and streamline many of these processes, but looking for quicker faster ways to get a good answer. I think we have swung the pendulum of transparency too far in one direction, and created a bookkeeping nightmare. We need to take a good hard look at how effective these processes are. If they are simply confirming the ‘obvious’ choice, or are they actually resulting in changes to decisions. If the are confirming the obvious choice, then maybe we can reduce the questions, or the time, and rely more on gut. If the processes are resulting in changes minds, look at what specifically changed your mind, and determine if we need more of that. Additionally, many L3s don’t feel obligated to work on projects, leaving the L3s that do feel obligated to shoulder lot of the work and being resentful, and burning out themselves. Reducing the total workload of the project heavy L3s and engaging L2 in previously “L3 only” projects will lead to happier members from both levels. The next part of the goal is going to depend heavily on if there are any OP changes coming, so…anything I suggest here is subject to change. But I see us needing to future proof the programs structure. While I haven’t fully gotten into the survey results yet, it seems that people want to advance in rank, while not having to deal with any of the mentorship or education aspects of the program. Essentially there is a vocal group want to do events and nothing else. Its very possible that we are moving to a future where “certifications” don’t really matter. A TO would be able to choose whatever judge they want, for whatever event they want. So we want our certifications have meaning outside events, but still allowing the people that want to only do events to do so. The challenge here is finding a way to maintain a structure and incentivize the qualities, education, and community we want to see in that environment. Right now I’m thinking a definition where we split event prowess from program work somewhat at each level. For example, we would have an L2. An L2 would be certified to run smaller solo comp rel events. They are not required to interact with the program in any way, just do your PPTQs in your local store. However, an L2 Leader exists. A leader has the comp rel certification, but also is recognized as a leader in the program. They can test Judges for L1 or L1 Leader. They can organize conferences. They participate in the forums or in projects. At each level, there is a “certification level” and a “leadership level”. (The leadership level requires the certification level.) The certification level governs what the program says you can handle at events, while the leadership level governs what you can do within the program. What this system allows for is for a future where certifications are essentially meaningless, then we still have a Leadership structure intact to educate and drive the program. Its not a fully flushed out idea yet and has a real hurdle is figuring out a way to incentive the leaders, so that we continue to get people who are willing to volunteer their time on the projects and committees and such, but judges would be able to participate more in the parts of the program they want to participate in. The committee will evaluate the applications and ask follow-up questions, which will not be made public. If you would like to contact the selection committee about one of these candidates or about the process in general, please e-mail us at pc-selection@googlegroups.com.